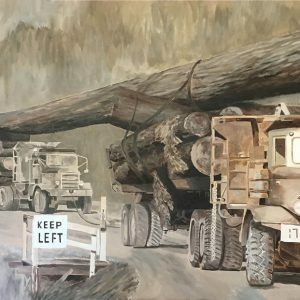 In 1958, a towering 250-foot Douglas fir began an arduous trek down Copper Canyon on two logging trucks, in what was the start of an 8,829-mile journey from Chemainus to the River Thames in London. You will note that a man stands in the open passenger door of the rear truck. He is keeping watch on the chain between the trucks, to ensure the proper distance between them is maintained. The tree, felled by MacMillan Bloedel employees, was originally 265 feet, but was topped to 250 feet for the trip to Chemainus, where another 25 feet were removed prior to shipping. Cates Towing transported the log to Vancouver. The world’s tallest flagpole, erected in 1959, was a gift from the Province of British Columbia to Kew Royal Botanical Gardens, celebrating both BC’s centenary, as well as the bicentenary of Kew Gardens. The flagpole was removed in 2007 due to rot.